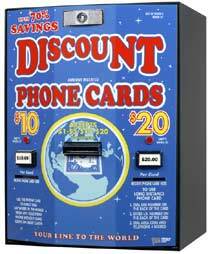 AC502 Phone Card Vending Machine (Dual Bin Dispensers) . This unique machine is designed to dispense any card that is 30mm thick and the height and width of a standard credit card. This unit can be ordered without decals so the purchaser can use their own custom signage to better suit their needs.